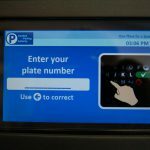 Hartford Parking Authority (HPA) is eliminating the need for parkers to display payment receipts on their dashboards while parking downtown. In January, HPA upgraded its aging payment kiosks with new technology. Since the upgrade was made, the parking kiosk display screens have requested license plate information in order to to get parkers in the habit of entering their license plate letters and numbers when parking. As of April 17th, parkers will no longer be required to display their payment receipts, however, parkers must properly enter their license plate information.